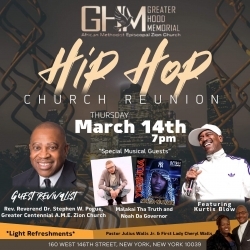 New York, NY, March 08, 2019 --(PR.com)-- Greater Hood Church announces the relaunch of Hip-Hop Church, for those who love God. Hip-Hop Church will feature music reflecting the culture for those who want a worship service with a more contemporary flow. Returning for the relaunch will be acclaimed Hip-Hop artist, Rev. Kurtis “Blow” Walker, one of the original founders of Hip-Hop Church. Rev. Kurtis proved that Hip-Hop Church can effectively deliver the message of Jesus to urban youth. The grand reopening of Hip-Hop Church will be on Thursday, March 14th at 7:00pm at Greater Hood Church, located at 160 West 146th Street, in Harlem, New York; this will be the first of many worship services of this type. Following the relaunch on March 14th, Hip-Hop Church will move to Fridays. Beginning on Friday, April 5, 2019, Hip-Hop Church will meet on the 1st Friday of each month for Hip-Hop Church First Fridays. Hip-Hop Church will deliver the same soul-saving, peace giving message of the loving Jesus Christ. Artists, known as ministers of music will deliver syncopated rhythmic rap lyrics to tell the world about Jesus. “The message of Jesus loving His people is the same, but the method of delivering that message will be different,” said Rev. Julius Walls, Jr., Pastor at Greater Hood Church. In Hip-Hop Church, there is more energy and movement utilizing rapped lyrics, stronger bass lines in the music, all while talking about the love of God and highlighting the societal challenges of a group that has felt marginalized by the traditional church. Hip-Hop Church is modern Black Liberation theology in a hip-hop music package that speaks to many who have been told to simply accept the way church is currently being offered. It will be the same message, but different method. Co-founder of Hip-Hop Church and now advisor, Rev. Dr. Stephen Pogue, at that time the pastor of Greater Hood, worked with Rev. Kurtis, Darren Ferguson (then choir director and now Bishop of Bethel Baptist Church), and John “Big John” Wright, church member. They organized the weekly worship services known as Hip-Hop Church. Rev. Pogue will also be returning for the relaunch. Hip-Hop Church will reach out to the urban community, to the unchurched and de-churched; further exemplifying Jesus’s consistently intentional acts of seeking reaching out and connecting to those who have traditionally been both economically and spiritually marginalized. Hip-Hop Church is available to people who want to meet God in a manner that relates to their lives, their music, and other elements of their lifestyle. The traditional Sunday morning church experience does not meet everyone’s needs, hence the creation of Hip-Hop Church, where anyone can meet Jesus. As Hip-Hop Church developed a strong following in its first iteration, the same can be expected now. Contact: Rev. Julius Walls, Jr.